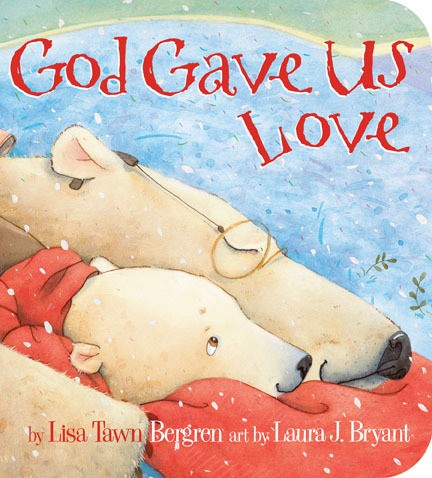 Book Review - "God Gave Us Love"
A great addition to the series, "God Gave Us Love" written by Lisa Tawn Bergren and illustrated by Laura J. Bryant, will be enjoyed over and over again by your young readers! Little Cub and Grandpa are fishing together and suddenly otters come and scare the fish away. Grandpa explains to Little Cub that the otters have a right to be there too and we must show love to others. This begins a discussion between Grandpa and Little Cub about love - different kinds of love and ultimately God's love for each person and His desire for us to show love towards others. This is an adorable book, both the story and illustrations! Being a board book edition, it is perfect for small children to look at and enjoy. Not only do my children love the story, but they also love pointing out different things in the illustrations as they add so much to the story! A great lesson once again in this series and your child is sure to love it! *I received a complimentary copy of this book from WaterBrook Multnomah Publishing Group. Book Review - "The Little Guitar"
"The Little Guitar," written by Eric Manos and illustrated by Eva Serencisova, is beautiful story for children that will be enjoyed by adults as well! A little guitar is created and she is beautiful both outside and inside as she loves lovely and sounds lovely when played. She is taken home by a little boy who is learning to play guitar and she tries so hard to make playing easy for him and to sound nice; however the little boy gives up after a few months and the little guitar is put away and forgotten about. During this time her strings break and she becomes broken, physically and her spirit as she is ignored and not used. One day she is placed on the front lawn as a part of a lawn sale and she is the last item there. Thinking she is going to become firewood, she is shocked when an old man picks her up. Spending many hours, the little guitar is refurbished and she finds her voice again. This is a beautiful, well-written story! This is a great story to share with children and can be used in several ways. Immediately while reading this book I thought that this would be a great book to share with children when they are attempting to learn an instrument as it can be an encouragement for them to not give up as learning to play an instrument is not easy and requires time and practice. However, it can also be used a discussion starter with children to talk about how there is more to a person than just his or her looks, or a discussion about each person being special and having talents. There are numerous possibilities! A great book that should be a part of every collection! to learn how you can become a member of the Book Review Team. Book Review - "Princess Stories"
So many little girls are into princesses and what better princesses for them to be introduced to than real princesses? 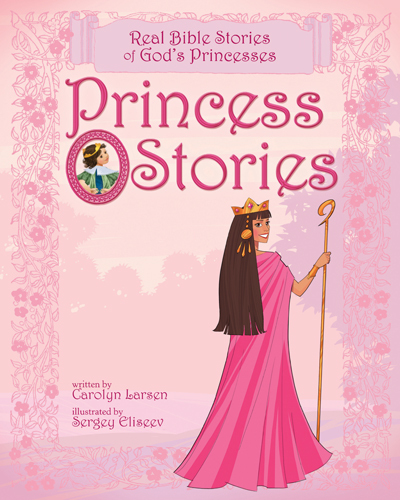 "Princess Stories" is a beautiful collection of Real Bible Stories of God's Princesses written by Carolyn Larsen and illustrated by Sergey Eliseev. This hardcover book is filled with beautiful, vibrant illustrations and short accounts of different Biblical princesses. The scripture where the story is found in the Bible is noted and there are questions to discuss with your little girls after reading each story. A few princesses included in this collection are Rebekah, Deborah and Ruth. Written in easy to understand language and a short account for each princess, a child's attention is easily held for each story. This is a beautiful hardcover book that I was excited to share with my daughter. It is a great way to introduce her to various female Biblical characters and instill values in her. This will be a great resource as she gets a little older as well when I would like to focus on specific values or attributes. This would make a wonderful gift for any little princess! Book Review - "Dawn Comes Early"
Margaret Brownley's latest series, The Brides of Last Chance Ranch, is a must-read with book 1 "Dawn Comes Early!" Disgraced dime novelist Kate Tenney fled the city that banned her latest novel for the emptiness of the desert. Answering an ad to be “heiress” to a vast cattle ranch in the Arizona Territory, Kate hopes ranching turns out to be as romantic as she portrayed it in her novels. But what awaits her is a life harder than the one she just left. There is no room for mistakes on a working cattle ranch, and Kate is ill-prepared for her new life. She quickly learns that dawn comes early. But she is tenacious. Having been abandoned by a string of men, Kate has no intention of ever marrying. But she didn’t expect to meet Luke Adams, either. Luke awakens feelings inside Kate she doesn’t recognize, and his steady presence is a constant distraction. She has only written about love in the past, never known it herself. But her feelings for Luke stand in the way of all she has to gain if she is chosen as the heir. I was drawn right into the story and fell in love with the characters as soon as I started reading! I really enjoyed the setting of the novel and I felt as if I was living on the ranch along with Kate and learning along with her. As a young girl I always dreamed of writing books and I love when main characters are authors or authors in secret and Kate struggles with her latest work will tug at your heart and have you cheering her on as she flees to the west! Book Review - "Words Spoken True"
Ann H. Gabhart's latest novel, "Words Spoken True," is my favorite of all of her books that I have read! I was immediately drawn into the time period, the characters' lives and loved every page! Adriane Darcy has never been viewed as being an appropriate lady of society as she was raised in her father's newspaper office (and does much of the writing herself) and is outspoken and lively. This is not considered to be society norm for the 1850"s in Louisville, Kentucky. Therefore, Adriane is surprised and dismayed when Stanley Jimson plans to marry her. Stanley is the son of an affluent family and his father is running for political office. Adriane's father is one of Coleman Jimson's supporters and also it is revealed that he is in debt to him financially. Adriane does not love Stanley, but she is willing to marry him if it is what pleases her father. Adriane meets Blake Garrett, a competing newspaper editor, and although he is the enemy, Adriane cannot deny her feelings for him. When Adriane learns things about the Jimson family, she decides that she cannot marry Stanley, yet she is not prepared for the aftermath of her refusal. I loved the characters in this story, there is so much depth to them. Adriane and Blake are both confronting and dealing with issues from their past and at the same time learning they need each other. Beck, Duff and Joe are such wonderful characters as well and their friendships and role in the story add so much. The political tensions and the mystery and fear surrounding the "river slasher" adds suspense and emotion to the story as well. A wonderful historical novel that will keep you turning the pages and loving the characters! Book Review - "Beauty for Ashes"
I really enjoyed Dorothy Love's first Hickory Ridge Romance, "Beyond All Measure," and I was not disappointed with the second book in the series, "Beauty for Ashes." The reader is thrown right into the story with Carrie being fitted for a wedding dress, not for her wedding but her brother's wedding. Then while leaving the dress shop Carrie is almost trampled by a horse and is rescued by a handsome stranger Griff. Not even knowing him, Carrie cannot believe that she invited him to be her date to her brother's wedding! Carrie is supposed to be marrying another man, Nate, in the future, but to date she has been unable to really commit and set a date. Nate is safe, and provides her with a practical love and life, while Griff's kindness and personality draw Carrie and she finds herself falling for him. Griff and Carrie are both waging battles within themselves in regards to their families and their pasts that is interfering with their hearts and heads. This is an enjoyable series to read! The stories are filled with romance, trials, sorrow, hope and joy making these emotional reads at times. The characters are so lovable and you will find yourself engrossed in their lives and decisions that must be made. Highly recommended for those who enjoy historical fiction! Book Review - "When The Smoke Clears"
"When The Smoke Clears," Lynette Eason's first book in her new series, Deadly Reunions, will keep you turning page after page until the very end and you will wish for more! Alexia has not been home in 10 years or had contact with anyone from home besides one of her best friend's Serena. When Alexia's firefighting gear is tampered with and she is also placed on probation as the investigation is taking place Alexia decides to return home for her 10 year high school reunion and to also check on her mother who is in the hospital. Serena is the only one who knows that Alexia is coming home, but as soon as she arrives at her mother's house a masked individual has killed her high school boyfriend in her mother's basement and someone appears to be out to get her. Hunter Graham is working the case and he finds his feelings are being personal as he had a crush on Alexia in high school. However, Hunter's brother seems to have feelings for her as well and is appearing every time something goes wrong, causing Hunter to suspect his involvement. As the lives of these individuals intersect and more and more attacks and incidents take place everything is surrounding an incident and secret from graduation night when Jillian, Serena and Alexia's best friend arrived at the after-graduation party terrified about something she had seen, but unwilling to share as she would place them in danger. Jillian disappeared and Alexia has not had contact with her since, but someone wants her found and the secret destroyed. This is such a great start to the series! It is an intense and thrilling read and I cannot wait to read the next book as there are still unanswered questions at the end of the book in regards to the incident on graduation night, who all is involved with the attacks, the role of Alexia's father with all of the incidents and the relationship between Hunter and Alexia. Chad and Christine are such great characters and I am looking forward to their roles in future books as well. Highly recommend this book to any suspense fan and if you enjoyed Lynette Eason's Women of Justice series, this new series is a must-read for you! Book Review - "Blue Moon Promise"
I am a huge fan of Colleen Coble's writing; therefore I was so excited to see that she has a new series! "Blue Moon Promise" is book 1 in her Under Texas Stars series. Lucy is taking care of her younger siblings alone and she is told that she can no longer live at their home by her landlord. This along with the mystery surrounding her father's death causes Lucy to agree to travel to Texas to marry a man she has never laid eyes on before. Nate is shocked when his father arrives home with a wife for him along with her younger siblings to care for. Neither Lucy or Nate are prepared for the danger that comes along or the feelings that grow between them. This is such a great story! Nate and Lucy are both such lovable characters! They are both strong individuals who stand firm to face the trials in their lives and follow their hearts when their heads question their decisions. This book is an excellent start to this new series and I am looking forward to book 2 coming out!